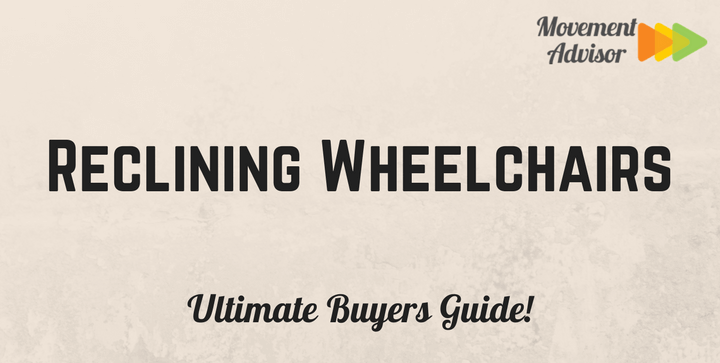 You have a lot to think about when selecting a wheelchair for your loved one. Not all wheelchairs are the same and not every wheelchair is going to be an appropriate choice for people with certain conditions. For example, if your loved one will be in the chair for an extended period, a reclining wheelchair is often a better option than a standard manual chair. People with conditions such as orthostatic hypotension can also benefit from using a reclining wheelchair. Like a reclining easy chair, the seat back of a reclining wheelchair tilts back. The reclining feature allows a person to change position in the chair without having to get up. Although the degree of the angle can vary from wheelchair to wheelchair, many allow a person to recline up to a full 180 degrees (completely flat). Some of the best reclining wheelchairs also allow you to lift the legs and feet up. The reclining feature and leg lift feature on some chair models means that a person can lie completely flat in the chair. Aside from the chair’s ability to recline, one of the biggest differences between a reclining wheelchair and a standard wheelchair is the mobility of the chair. Both types of chairs allow for movement. But it’s usually easier for a person to move about in a conventional wheelchair. Many conventional wheelchairs are self-propelled, meaning that a person can move about in the chair without assistance from another. Since the purpose of reclining wheelchairs is to give a person a comfortable place to sit for extended periods of time, there is less of a focus on movement. For the most part, a person in a reclining wheelchair will need to have someone else push the chair from one location to another. The wheels on many reclining wheelchair models are too small for a person to push him or herself. Elevating Leg Rests. Not all reclining wheelchairs also allow you to lift the legs up. Keeping the knees bent while the back of a person fully reclines is not only awkward, it can be very uncomfortable. Moveable Armrests. Ideally, the armrests on the chair will move with the person. That means that they will adjust as you adjust the seat to back angle of the chair. Ideally, the armrests should also flip down or out of the way to make it easier to get a person into and out of the chair. A Headrest. Reclining wheelchairs typically have a higher back than conventional wheelchairs. Although not a requirement, a headrest can provide better support for the head when a person fully reclines in the chair. Seat Cushioning. Cushioning in the seat makes for a more comfortable chair. Cushion options typically include gel, memory foam or foam. Memory foam tends to cost the most, but also offers the most comfort since it readily molds to the body. Tilt. A tilt feature on the wheelchair helps reposition the body to ease pressure and lower the risk for bed sores. Sometimes, reclining wheelchairs and tilt-in-space wheelchairs are separate. Some models combine the two features, offering the best of both worlds. Seat Shape. The angle and shape of the seat not only improves comfort. It also makes a person less likely to slide or slip out of the chair. A V-shaped seat, for example, helps reduce the chance that a person will slide out of the chair. Anti-Tip Feature. Some reclining wheelchair models have an anti-tip feature, which keeps the chair from falling over backward when a person is reclining in it. Another feature worth considering when choosing a reclining wheelchair is the size. The size of chair you choose depends on the size of the person who will be using it. Standard wheelchair sizes range from 16 to 20 inches in width, with the most common size being 18 inches. Some models also offer a 30-inch seat width, for people who weigh over 300 pounds. Although many wheelchair models have a seat depth of 18 inches, if your loved one is shorter or taller than average, you might need to find a model with a deeper or shallower seat. You can determine the size of the seat depth you need by measuring from the back of the person’s shins to the back of his or her pelvis while seated. One of the biggest pros of a reclining wheelchair is that it allows a person to change position without getting out of the chair. An individual who wants to take a nap or rest while in a reclining chair can adjust the seat back and leg rests to a 180-degree position. The ability to change position quickly in a reclining chair also makes it an ideal option for caregivers. It is much easier to change a diaper or catheter on a person when he or she is in a reclined position compared to when he or she is sitting upright. Plus, many people find it easier to help a person out of a reclining wheelchair into a bed or another chair than to help a person out of a conventional chair. Reclining wheelchairs aren’t right for everyone, though. 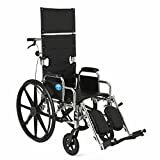 Although you can transport the chair or move a person around while seated in one, they usually not recommended for people who are looking for a chair to serve as a means of transportation. Many models can’t be self-propelled, so they aren’t exactly suitable for independent people. Models that do have larger wheels and can be self-propelled tend to weigh a lot, making them difficult to move. The Drive Medical Silver Sport Reclining Wheelchair has three seat widths available: 16″, 18″ and 20″. Although it doesn’t have all the features you’d want in a reclining wheelchair, it has several of the most important. For example, it includes elevating leg rests and has a seat back that reclines up to 180 degrees. The arm rests on the chair also adjust as the seat reclines. It also includes padding on the armrests and a cushioned headrest. While the wheelchair doesn’t include a seat cushion, you have the option of purchasing a skin-protecting cushion separately. The model is a self-propelled wheelchair, with larger back wheels. It also has wheel locks that are tall enough for the person sitting in the chair to access. Most importantly, the position of the wheels on the back of the frame keeps the chair from tipping over. 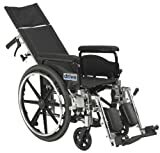 The Drive Medical Viper Plus GT Reclining Wheelchair features an adjustable seat depth, from 16 to 18 inches, and an adjustable back height from 17 to 19 inches. The chair fully reclines and includes elevating leg rests. What sets the Viper Plus GT apart from other models is its aluminum construction. The wheelchair is truly lightweight, coming in at under 32 pounds. It also includes large back wheels, so that a person sitting in the chair can propel it him or herself. The Medline Reclining Wheelchair is a good, frills-free wheelchair. It’s available with an 18-inch seat width and has a 22-inch back height. It doesn’t recline the full 180 degrees but instead reclines 140 degrees. Although the chair includes elevating leg rests, some have complained that they do not provide enough support. If the person in the chair has limited use of his or her legs, it is possible for them to fall out of the leg rests while reclining. On the plus side, the leg rests are easy to move out of the way when getting a person into and out of the chair. The Drive Medical Sentra Reclining Wheelchair has something other models don’t: four seat sizes. The chair is available in 16-inch, 18-inch, 20-inch and 22-inch seat widths. Like other Drive reclining wheelchair models, it reclines a full 180 degrees and has elevating leg rests. One downside of the chair is its weight. It’s made of carbon steel, which makes it extra sturdy but also makes it clock in at a whopping 65 pounds. Size, weight and features are all worth considering when choosing the best reclining wheelchair. Since your loved one will be in the chair for much of the day, it’s essential to keep his or her comfort at the front of your mind when choosing the best wheelchair.